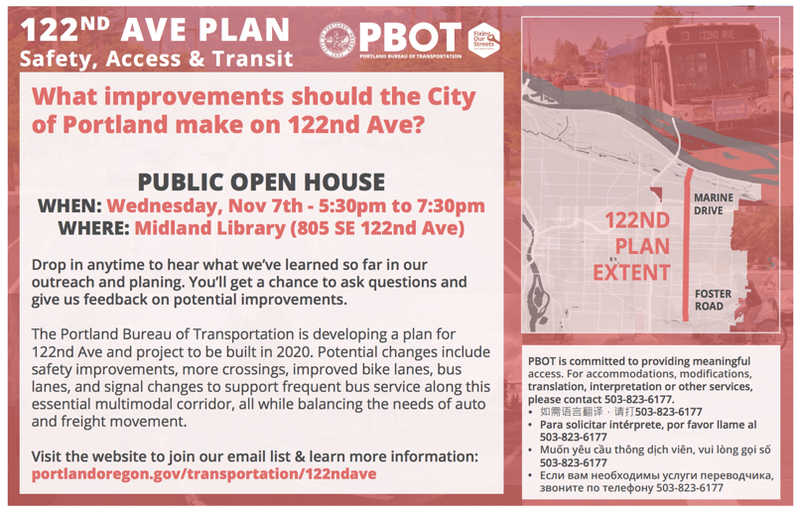 PBOT is developing of a plan to identify improvements on 122nd Ave, between SE Foster and NE Marine Dr. We will consider changes to the street cross-section, additional enhanced crossings, lighting, signal changes and more to meet the following goals. Overarching Goals: Increase safety for all, improve pedestrian & bicycle access and support better transit while balancing needs of freight & other modes. Identify improvements to help eliminate serious injuries and fatalities and remove 122nd Ave from the Vision Zero High Crash Corridor network.